After being apart of a 5am group myself awhile ago, pursuing a life of productivity and discipline with a community of people all around the world with the same desire by committing to wake up each morning at 5am and accomplish there goals before most people are even awake. I realize I wanna keep it going because I saw amazing results in my life and the amazing results everyone else in the group was getting. So that is why i started this group and would love to have you apart of it! I know you will be happy that you did! We have an Instagram Pod going where we chat, share and encourage each other to wake up at 5am. 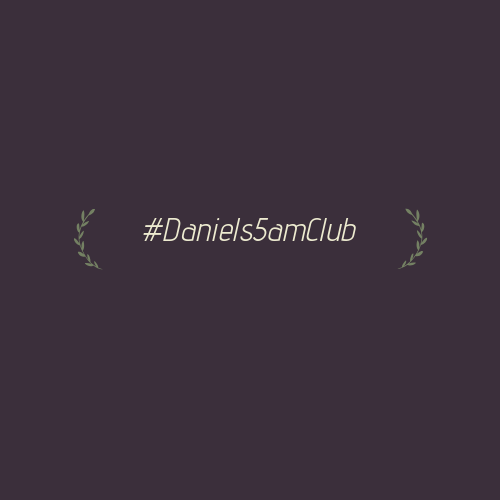 The Challenge is to take a Instagram Story of you up at 5am doing something productive and use the #Daniels5amClub so that we can repost it and share it with others to motivate them to join the challenge and wake up at 5am to max out their life. The goal is to do it for 30Days in the row to create the habit and make it concrete in your life! - If we get lot’s of people joining we will start a Facebook group as well to have better communication with each other! An effective way to get up when your alarm go’s off is Not to give your brain time to think about it.. As it will come up with many reasons to stay in bed. Instead immediately count down from 5 and on ‘1’ just lift up off your bed! If you miss a morning and sleep in.. Don’t be hard on your self or be disappointed! Just get some good sleep and try again next the next day! Don’t give up! Fill out the Form Below to join the group and you will be sent an invite to the Instagram Pod!